This topic contains 18 replies, has 11 voices, and was last updated by Alan Corbin Jan 14, 2016 at 6:30 pm. Ok looking to get started tying some flies. 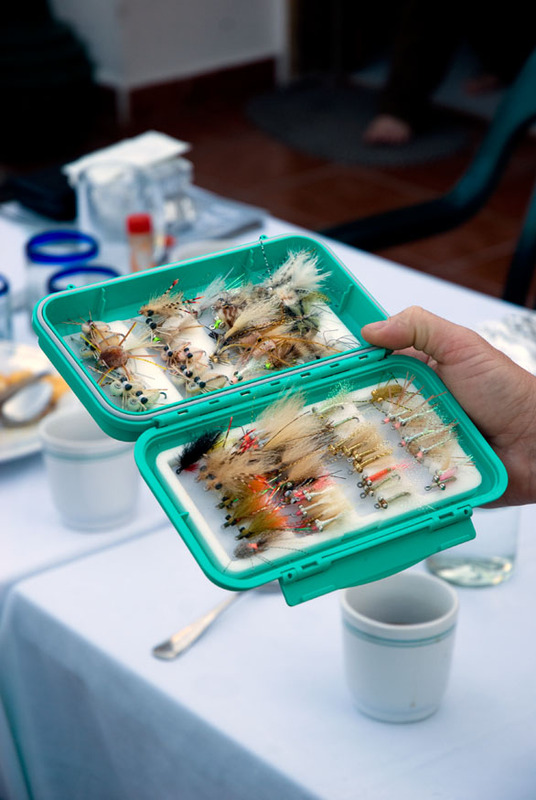 Charlie Craven (Charlie’s Fly Box) is one of the best fly tyers I have ever encountered. I actually shared a room with him for a couple nights down in Mexico – he is a good dude. His permit and bonefish boxes were insane; it was like looking into a museum-grade candy store. That’s his book on basic fly tying and it would be a good place to get started. I just bought his book. It has so much info on the techniques of fly tying. I have a youtube channel you can check out. Although to be honest, warm water fly-tying is kind of a wild west. There are some great patterns that are what I think of as building patterns. Might help direct you with videos, books etc. I tried to make the information fairly easy to follow and step-based. Also look into your local FFF chapter (if there is one) or consider attending one of the regional events. Thanks so much for the book info exactly what I was looking for. Your videos are what I have been watching that got me really interested in it. I started fly tying last year for a trip to Los Roques as saltwater flies weren’t easy to find locally. To be honest, the books disappoint me. Videos are what did it. Youtube and the likes. I learn more from video (and still do) than from any of the photos in books. Beauty is you can watch, rewind, watch again, fast forward etc. Thanks for the guidance and I agree the videos are likely to be more valuable. For someone that is considering the idea of tying some flies myself, would you guys recommend going with a starter kit or piece it out? Where do you guys buy your supplies? I’m thinking I would only need a whip finish tool, a vise, a bobbin, some hooks, beads, wire, and thread to to get started. I’m sure I could find some scissors laying around the house. I’m thinking I could start off tying midges and then branch out from there if I get hooked. When I started tying flies I would pick a pattern, and buy the necessary materials for that particular fly. After doing it this way for a while, eventually you end up with pretty much everything you need to tie most flies. As far as tools, I started out with a vise, bobbin, hair stacker, hackle pliers, small scissors. I might be wrong about this, but I would probably shy away from a starter kit. Initially, I bought my supplies from a local fly shop (which also offered beginning tying classes). Since I’ve moved to an area that doesn’t have a local fly shop, I actually haven’t had the need to buy any tying supplies yet. If you have to purchase online, Feather~Craft (and I’m sure others) looks pretty good. Anyway, I totally agree with your approach. I was thinking I would start out with a few simple flies, like y2k and San Juans for the Amicalola river (nearest river to me), and then some midges for the Toccoa river which is the next closest (big) river to me. Clay and Mike we should have a tying session at my house. I’ll show you guys what you need to know. I think I’m getting fly tying gear for christmas so I’m looking to put together my materials list to learn to tie a few different types of flies. Woolly Buggers/Clouser Minnows/Stealth Bombers. Are there any materials obviously missing from my list (other than craft foam/head cement)? So my learning to tie list includes clouser minnows and crease flys. I’m looking at the epoxy vs UV discussion and looking at what I plan to do I’m curious if there is any reason to consider epoxy? Assuming UV is what I should go with my 2nd question is what brand would you choose? If I am tying a dozen or more flies at once I prefer to use epoxy. I get them all to the point where the epoxy is applied and coat them and put them on a drier to keep the epoxy even. Rod finish takes a lot longer to cure also(4-6 hours) and I usually will finish a rod and the flies at the same time. I will use rod finish epoxy usually because it stays clear and is more flexible than 5 minute. I f I know they are going to get destroyed in one season I use 5 minute, as i don’t care if it yellows because they are junk by the time the saltwater and UV rays deteriorates them. UV is good for a few flies at a time. It is more brittle than epoxy also but doesn’t yellow.